My coworker Peter first introduced me to his friend, Reed Adelson, a few years ago when he was the manager at Locande Verde. I remember hanging out there for lunch and enjoying the most tender meatballs and pasta while chatting with Reed. Always the consummate host, he graciously accommodated my guests on all my visits (he handled last minute changes to a coveted Trufflepalooza dinner back in Nov 2013 with ease) and always treated everyone with respect and courtesy. When I heard he was branching out and opening up his own restaurant with chef Christian Ramos, I was incredibly happy for them. You can't help but notice the rustic vibe when you walk into Virginia's, (named after Reed and Christian's mothers) with the open windows and natural sunlight pouring in. Supple, leather banquettes with understated wooden tables and chairs line the wall. Framed menus from renowned restuarants adorn the walls. Clean and classy. 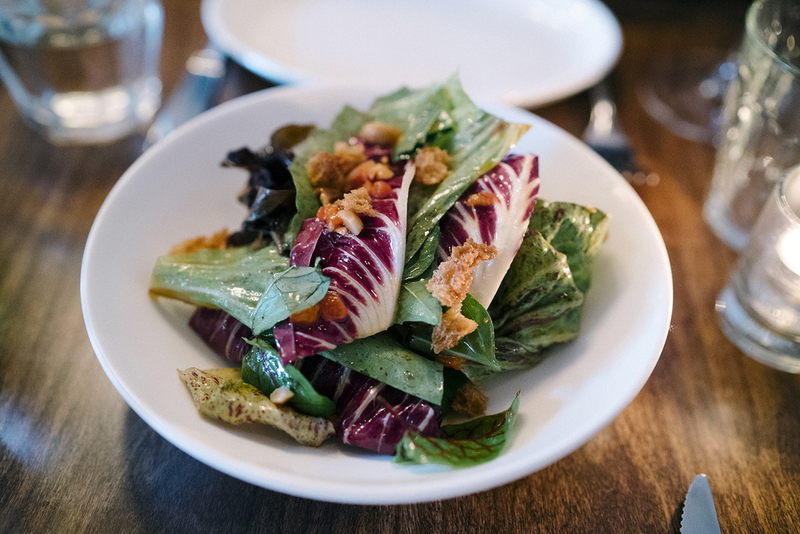 Our first dish was a radicchio salad with hazelnuts. The bitterness reminded me of why I don't like radicchio. I look forward to ordering their next salad (they constantly change the menu depending on the available produce). 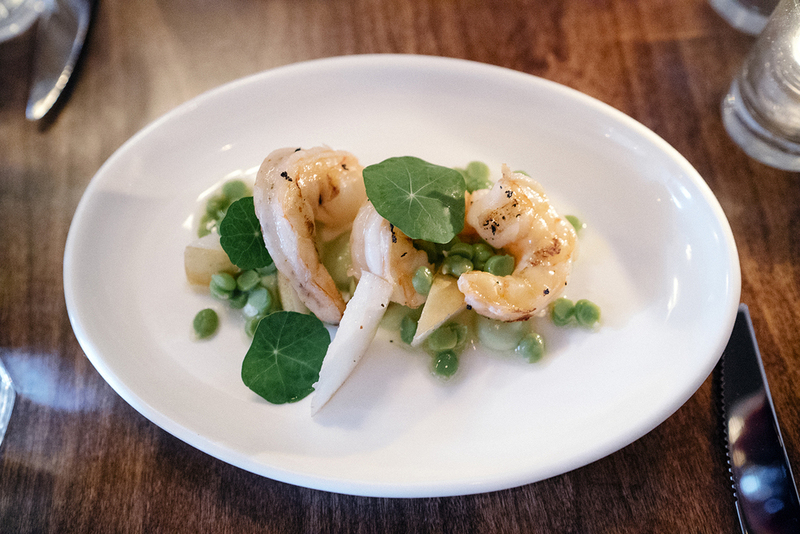 Grilled white shrimp with peas, garbanzo beans, and Asian pear followed. Perfectly cooked, you'll wish there was more than 3 pieces. Roasted suckling pig was the weekly special. The meat was seasoned and tender while the skin had a nice crisp to it. Loved the savory sauce too. Favorite dish of the night was the superbly grilled hangar steak. Nice and rare with a nice peppercorn char for an extra punch. Also came with a few slices of Argentine chorizo. Double meat is always ok in my book. I ordered the crushed potatoes, expecting golden, fried chunks of potatoes with crispy skin like the heavenly version I had at Degustation but instead they were mashed potatoes with sour cream and chives. Maybe change the name to "mashed potatoes" on the menu to avoid heartbreak. The mushrooms were simply prepared which allowed the potent flavor to come through. Not too oily like other renditions. Must order. Post dinner drinks at the bar with the talented Ginger who made me something that reminded me of an old-fashioned but sweeter. We had dessert at the bar, a silky honey panna cotta with rhubarb compote and rye biscuits and a nice chocolate beet cake with beet mousse. Never thought to pair the two seemingly disparate ingredients but they work quite harmoniously. A few weeks later, I went for a second visit with Sammy and my brother. We started off with another delightful cocktail by Ginger. Knowing my palate, she concocted a delightful fruity cocktail that had a hint of vermouth for bitterness. Our first savory dish had a few fried sweetbreads with peas. My only criticism is that I thought the sweetbreads could have been fried more. The batter on it wasn't as crispy as I would have preferred. Also wish there were a little more on the plate. The grilled cauliflower and romanesco was a hit. The vinaigrette had a nice acidity to it that made the whole dish refreshing. A great palate cleanser for the savory proteins coming up next. The seared duck breast was cooked perfectly. Superbly juicy and not overcooked which is hard to pull off (I've eaten too many rubber ducks in the past). I had some nice fatty pieces that really highlighted the quality of the duck. The crispy skin on the striped bass was my favorite. As my fork made contact, you could hear the "crack" of the skin as it gave way to the flaky meat underneath. The broth tasted of the sea and complemented the fish. Gnocchi with morels had great earthy flavors, although slightly overcooked a minute too long. Wish it was just a bit more al dente. My goal of soaking up the delicious butter sauce with the gnocchi was achieved until the plate was wiped clean. Since it was summer, peaches made a cameo and was the star of this simple dessert. Love the texture of the crumble. The sun was shining as I walked along Ave C. I was meeting up with Lilian for en early dinner before she left for Hong Kong and Australia. It had been a few weeks since my last visit and about 85% of the menu was different. A new item appeared on the menu that we were interested in trying: the Summer Squash Toast. The bread was perfectly toasted and crunchy. The sliced squash was fresh and clean but was unfortunately marred by the salty tapenade that was on top. If you do order this dish, ask for the tapenade on the side. The grilled oyster ceviche was another perfect dish to celebrate summer. Crunchy cucumbers, salsa verde, briny oysters, and a piece of toast hit all the notes. But for $16, there has to be more than 2 oysters. The seafood motif continued. A gorgeously garnished place of seared cuttlefish appeared. Virginia's rendition had a tender texture instead of the usual rubberbands served at other restaurants. The togarashi mayo on the side gave the dish a great savory punch. However, like the squash toast, there was some sort of tapenade on top that was a bit too salty for my taste. I'm a sucker for risotto. It brings up a nostalgic note from my Chinese upbringing of when I had bland xifan topped with tufts of dry pork and pickled radishes. Risotto for me is xifan 2.0 where the flavors are more intense and melded together better. 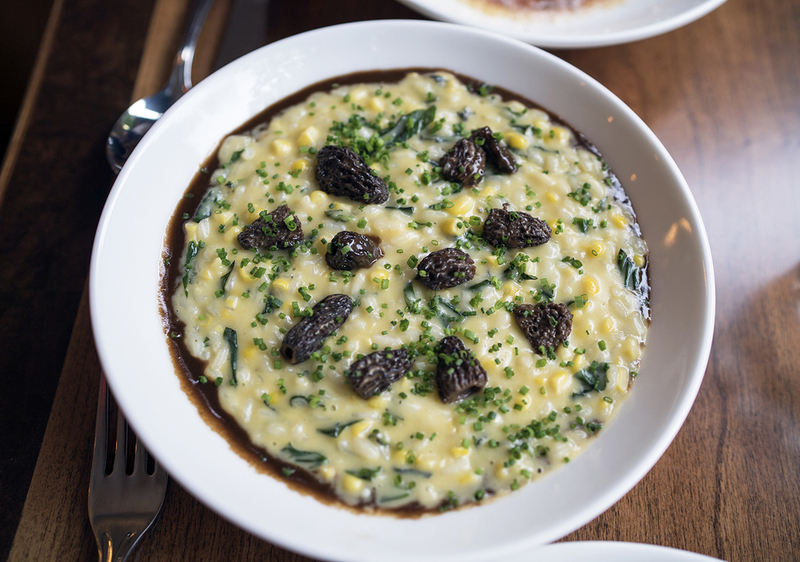 Dios mio, this sweet corn risotto with morels is my favorite risotto ever and my favorite dish at Virginia's so far. Risotto cooked perfectly (not too mushy) with earthy morels balanced by the sweet corn. There is also some amazing mushroom jus surrounding the bowl like the lunar eclipse logo from HEROES. All the sweet and savory flavors were in perfect harmony as I spooned bite after bite into my mouth until it was all gone. Definitely order this if it's on the menu. Lilian ordered a sea bass with a sauce that contained raspberries. I get that they wanted the raspberries to provide a little sweet, a little sour but just not a fan over the sauce overall. I'm more partial to Japanese preparations such as saikyo miso. I'm a new fan of Red Wattle after having it at Marta's first and now at Virginia's. This was a decent portion of a Red Wattle porkchop that was not only juicy but had a real depth of flavor. The berries in this one added a hint of syrupy sweetness. My fourth visit was last week with my friend Anne. We sat at the bar and ordered some refreshing summer cocktails. The dinner began with the toast again but with different ingredients: juicy heirloom tomatoes, silky housemade ricotta, and a less salty tapenade. Great starter to whet the appetite. Next we enjoyed a new addition to the summer menu, citrus cured salmon, honeydew and mint. It stood out in both texture and flavor. Slippery, oily salmon in one bite. Then a spoonful of cold sweet honeydew soup that balanced it out. Finally, submerged bits of mint that refreshed and cleansed the palate. After my stellar risotto from last time, I had to order again. Instead of morels, it came with chanterelles, okra, and squash blossoms. Not as good as before (because I love intense morel and mushroom flavor) but still very flavorful with a pronounced parmesan flavor that lingered on the tongue. The okra lent a creamy texture and the squash blossoms added a subtle crisp. Looking forward to the seasonal ingredients that will be used for the next risotto. The hangar steak with a side of Argentine chorizo was even better the second time around. The ruby red color of the sliced meat as well as the scattering of Maldon sea salt flakes made for a pleasing visual. Next the taste - perfectly seasoned and charred with succulent juices running out of the meat. From a pure flavor standpoint, hangar is still my favorite...I'd pick it over A5 Wagyu. We had a side of carrots that looked like it was just picked from a garden. Bright orange with assorted greens and turnips, the "garden" was the perfect complement to the steak. To finish off the meal, we ordered both dessert options. This time, the panna cotta had a blueberry compote and was as delicious a the rhubarb version on my very first visit. Loved the addition of the crumbly cookies. It reminded me of crumbled graham cracker pie crust which might be my favorite thing on earth. We followed that up with a Black and White Sablé (shortbread cookie) with cocoa nib mousse and pistachio. Anne's favorite part was the homemade dulce de leche under the cookie - she would have bought a jar of dulce de leche if they had them. This dessert delivered in taste and texture - caramel notes from the dulce de leche smeared onto the crumbly shortbread. Then you have the pillowy clouds of cocoa nib mousse that wasn't too sweet and a bite of the salty crunchy pistachios. Soft, crunchy....sweet and salty made for a well-balanced dish. After we said our goodbyes to Reed, Christian, and the staff for a wonderful meal, we made our way to the exit. The dining room was in full swing with multiple conversations at full volume. There was an electric energy that followed us out of the door into the balmy evening. Start at the bar. Just tell Ginger what your current mood is and what you'd like to feel. 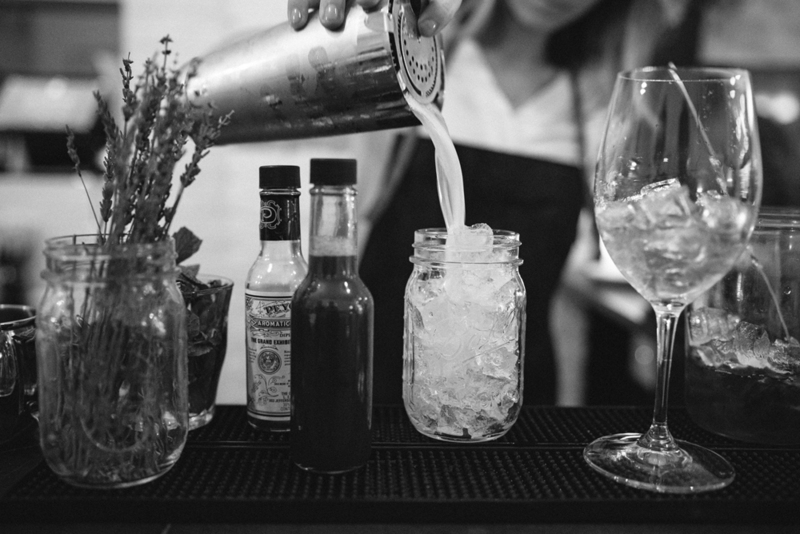 A drink will appear in your hand in a few minutes to transport you wherever you want to go. After 4 visits, I have tried almost every dish as well as their variations. My ideal meal would include: the toast to start, hangar steak med rare, risotto of the day, duck breast, and the mashed potatoes and mushrooms for sides. Finish with all the desserts since there are usually 2-3. If you go with 4 people, you can pretty much divide and conquer the whole menu. Check out the framed menus on the wall from famous restaurants all over the world. I was comped a few dishes in exchange for some photographs. That didn't bias my review.